You’d do anything to keep your rabbits happy. You buy them the best possible food, spend a small fortune on vet bills – because they are worth every penny – and treat them like one of the family. Then one day you turn your back for a few moments and a predator strikes. You thought it wouldn’t happen to your rabbits. But with foxes now increasingly common in urban areas, it’s more vital than ever to ensure your rabbits are safe. There’s nothing we want more than give our rabbits the freedom to run, play, chew and dig in the garden. But for a helpless creature like the rabbit, the garden is also a place of danger from toxic plants and chemicals, disease, escape and of course predators. Attacks on pet rabbits are on the increase as foxes are now very common in urban areas. It is estimated that 4 out of 5 outdoor rabbits don’t live to the end of their natural lives. Most caregivers believe that keeping rabbits in a hutch and run offers adequate shelter. While a sturdy hutch and run are obviously better than flimsy ones from a pet shop, they cannot stop a rabbit dying of fright when he hears or smells a predator. Rabbits don’t have to see a fox to detect its presence and can easily go into a state of shock. As a result many outdoor rabbits are found dead in the morning by their caregivers. Even if your rabbits survive visits by foxes and other animals, we can only imagine how frightening these experiences must be. Stress can also trigger illnesses such as Pasteurella. Cottontails advises caregivers to supervise their rabbits at all times when they’re in the garden, and bring them in at night and when they go out. Supervision is the responsibility of an adult. The garden must be well fenced all around to prevent your rabbits escaping. Even so it can still be easily accessible to predators such as cats, dogs, foxes, badgers, stoats, weasels and large birds. It is not just animals who can attack your bunnies if left outdoors unsupervised. Some rabbits are the victims of theft, teasing and attacks by humans. You may think your rabbits are safe if you pop in the garden every few minutes or keep an eye on them from the house. Unfortunately this is not the case. Foxes and other predators are active in the daytime as well. Their superior sense of smell, sight and hearing enables them to spot your rabbits very quickly. They are bold, clever, agile and quiet. One of our adopters was horrified to see a fox half way up the stairs in her central London home. Luckily her companion bunny Lucy ran to her and thumped to alert her to the intruder. It only takes a second for a fox or cat to come in through an open door, so it is vital to watch your rabbits even when they are in the house if you have left the garden door open. Open windows at basement, ground and first floor level can also provide a way in so remember to close them at night and when you are not around, or fit a sturdy mesh frame. You may think it is natural for rabbits to live outdoors, but companion rabbits are domesticated animals who depend on humans for food and shelter. Not even wild rabbits are as exposed to danger as garden rabbits, having a safe burrow to retreat to. 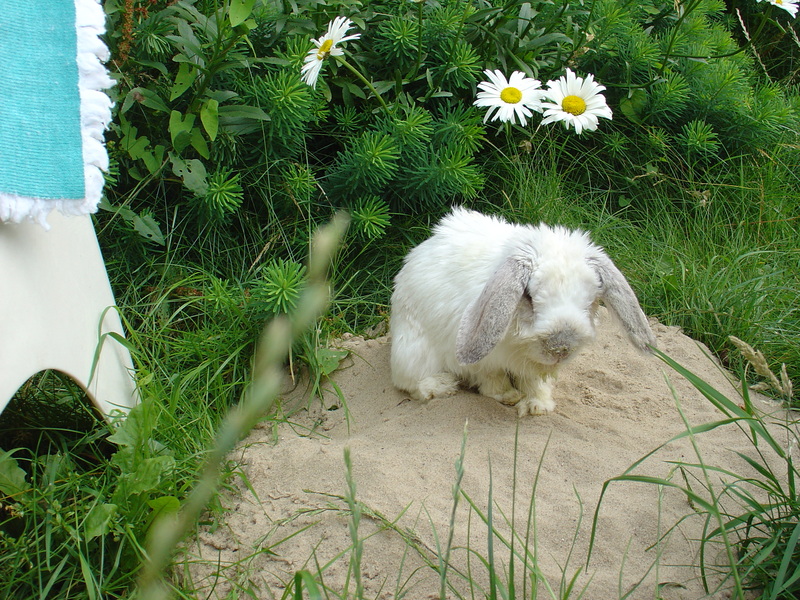 However letting pet rabbits dig warrens is not recommended, as they tend to sleep there in the daytime and come out at night when predators are more common. Rabbits also tend to hide in their burrows when they need care, e.g. when they are ill, and you will not be able to get them out. At Cottontails we provide burrow-like places above ground in the shape of clay pipes, wooden tunnels and cardboard boxes. We also offer digging areas such as sandpits and litter trays full of soil. Any holes that the rabbits dig in the ground are refilled at the end of the day. you are physically there with them, not just watching from a window. you concentrate on the task at hand (watching bunnies frolic is also a nice way to relax!). If you are busy reading or talking to someone you may well miss a predator coming in the garden. If you need to go indoors, even if it’s just for a minute, put the rabbits in a run, which requires less supervision (but not no supervision), or bring them in. Exercise runs should have a double layer of welded mesh on the roof and sides and a single layer at the bottom, through which the grass can grow. Provide at least one hiding place, such as a clay pipe or a wooden box with two exits. walk around the garden from time to time to spot and/or deter possible predators. check the fence regularly for gaps and the ground for holes. If the postman comes or the telephone rings while your rabbits are loose in the garden, do not be tempted to leave them unattended. You can arrange redelivery and people can call back or leave a message (or have your cordless telephone handy). We now ask visitors to allow a few minutes before we come to the door or call us from their mobile as they approach the house, to give us time to bring the rabbits in. If your garden is very large or overgrown, or you have less time to supervise your rabbits, you must provide a pen for daytime exercise. At night and when you go out the bunnies can have the run of one or more rooms or a safe outbuilding. If you think there are no predators in your garden remember that you will not get a warning when one is about to strike. A hungry fox will quickly get used to security lights and other deterrents. Leaving food outside for squirrels and birds will attract other animals and should be avoided. Cottontails does not support keeping rabbits outdoors as we believe their place is in the home. In the daytime they can exercise in the garden with supervision, thereby enjoying the best of both worlds. If your rabbits live outside they should have the run of a shed, playhouse, disused garage or other building with solid walls, a lockable door and windows to let in natural light. Keeping rabbits in a hutch is not recommended for humane and safety reasons. But fitting locks and a double layer of welded mesh to the doors – and a louvred panel at night – will help to protect your rabbits. The hutch should be made of sturdy wood and be close to the house rather than out of sight. *Figures compiled by Cottontails between January and June 2002 show that 80% of outdoor rabbits die prematurely following attacks by foxes and other predators, lack of proper fencing (which allows them to escape), poisonous plants and chemicals (e.g. pesticides, slug pellets), weather extremes, neglect and undetected illnesses (e.g. flystrike, GI stasis, myxomatosis and other preventable diseases). Although I’d never met Lollipop Hall, I knew how special this little grey rabbit was to his caregiver Theresa. Theresa is a friend of Cottontails and adopted our foster bunny Pebbles as a companion for Lollipop 4 years ago. She lives in a lovely garden flat in central London, and is able to devote a lot of time to the rabbits as she is at home during the day. Lollipop was Theresa’s first rabbit and a healthy 7 year old full of life. He loved to run around the garden and nibble on the plants and grass. As Theresa is a talented artist she sometimes included him in her paintings. Lollipop and Pebbles had the run of the flat and at night they slept on Theresa’s bed. Theresa is the best rabbit caregiver. She had never seen a fox in her garden but even so she always supervised the rabbits when they were outside. On the morning of 25 April she popped indoors for a few moments to collect the post and empty the rabbits’ litter tray. This didn’t take more than three minutes. When she returned to the garden, she saw a fox dash over the fence and Lollipop lay dead in the grass. Lollipop had only suffered a small wound. It was the shock of being attacked that killed this sweet, irreplaceable bunny. Theresa is devastated by Lollipop’s death but asked us to publish her story as a warning to other readers. A few weeks later she contacted Cottontails to adopt a friend for her remaining bunny, who was pining. Through the Bunny Hopline we were able to put her in touch with a lady who had just called us to rehome her four year old rabbit Snowball. Snowball was allowed to wander in the neighbours’ gardens despite the presence of foxes in the area. It is a miracle that he survived for four years, while it only took a moment for Lollipop to lose his life. Theresa immediately agreed to adopt Snowball, and the bunny is now safe in her flat. We hear he is the most adorable, friendly rabbit who loves to be picked up and be made a fuss of. He has been neutered and will shortly be introduced to the gorgeous female bunny he’s met through the baby gate. If like Theresa you would like to adopt a rescue bunny please search the Bunny Hopline. Snowflake’s story is a reminder that cats can also kill our companion rabbits. Snowflake was a beautiful New Zealand white rabbit, the size of a big cat, and caregivers sometimes forget that no matter how large, rabbits remain defenceless prey animals sensitive to stress, predators’ smells, sudden movements and noise. The morning of 6th March 2003 was so warm and sunny, it was more like summer than late winter and Snowflake and I enjoyed our usual walk around the garden, me drinking my coffee and Snowflake zigzagging and sprinting back and forth, stopping at my feet from time to time to be petted and make sure I was appreciating her performance. As always I was on cat and fox alert, especially since an aggressive young cat had appeared in the neighbourhood a few weeks earlier and was attracting other cats into the garden. After an hour of frolicking and grazing on the lawn, I placed Snowflake in a large covered run while I returned to the kitchen to feed one of our foster bunnies. I would never have left Snowflake loose in the garden unsupervised and she was used to spending short periods in her run during busy times. Snowflake had been an outdoor rabbit for three years before we rescued her from a family that kept her permanently locked up in a small hutch. She must have been quite familiar with cats visiting her and I was told she even survived a fox attack that killed her brother. After being rescued, Snowflake quickly blossomed into a bright and sociable bunny and really deserved a second chance after a lifetime of cruelty and neglect. From the kitchen French doors I could see Snowflake in her run just a few feet away, and everything seemed fine. But five minutes later I heard a thump and when I looked up there was a ginger cat pawing at Snowflake’s run. I immediately ran outside to scare the cat away and then went to comfort Snowflake but it was too late. As I turned towards the run, she was already lying on her side shaking, her eyes rolled back. I tried to calm her but to no avail – she died of a heart attack. It took less than thirty seconds from the moment the cat appeared to Snowflake dying.